Summer’s here, and thanks to “global warming” it feels crazy hot in NYC and all over the country. An ancient form of healing, Aryuvedic medicine, can help keep you cool during these hot summer months. Ayurveda emphasizes re-establishing balance in the body through diet, lifestyle, exercise, and body cleansing, and on the health of the mind, body, and spirit. This ancient form of healing contains secrets to staying cool when the temperature is reaching record highs. Summer is fire or Pitta season in Aryuveda, and when you learn what to eat and how to act to balance this element, you will feel cooler and more comfortable all season. Pitta is made of fire and water. 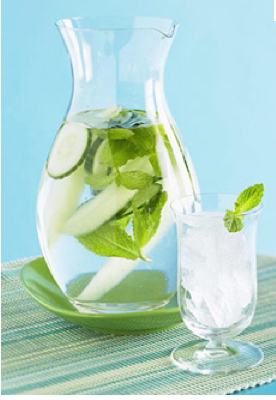 During summer season you can reduce Pitta heat within your own body by eating a diet of cooling foods. The best foods to keep you cool during summer are watermelon, cucumber, mint, coconut, summer squash, fennel, cilantro, and aloe vera. Makes sense, right? Eating foods that are grown in the season and that will keep you cool. It’s best to avoid spicy, salty, acidic and greasy foods during summer as they will increase the heat in your body and make you feel hotter. Below are some basic Aryuvedic guidelines to help you keep cool this summer season! Eat more foods that are Sweet, Bitter, Astringent / Cold, Heavy, Oily: such as salads, smoothies, fresh fruit. Eat less foods that are Spicy, Sour, Salty, Hot, Light, Dry: such as spicy foods, hot beverages. Choose fresh ripe berries, melons, apples, apricots, grapes, peaches, pears, pomegranates and ripe plums. Favor asparagus, bell peppers, broccoli, cabbage, celery, cilantro, leafy greens, seaweed, snow peas, and summer squash. Drink herbal teas such as mint, hibiscus, dandelion and chicory. This entry was posted in FIERCE HEALTH, FIERCE SOUL, FIERCE- ISH and tagged Aryuveda, aryuvedic medicine, balance, bocy, cool, diet, food, fresh, fruits, hot, nutrition, pitta, summer, vegetables, water by GETFIERCE TRAINING. Bookmark the permalink.